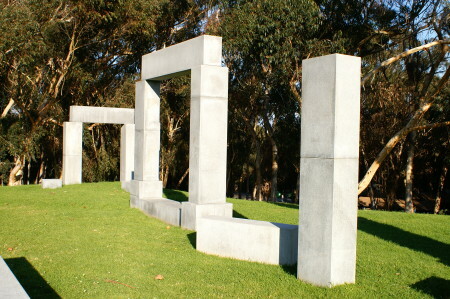 Often called “Stonehenge,” for obvious reasons, perhaps the heaviest item in the Stuart collection is La Jolla Project by Richard Fleischner, installed in 1984. It is a grouping of solid granite columns and beams which form mostly asymmetric shapes over a Revelle college lawn. Most of the parts are centered in one area, but a few are scattered over the entire lawn. Most of the shapes are tall, but there are some squat pieces, probably meant to be sat upon. Some granite pieces are laid to suggest decay, littered below tall, naked columns. To me this art speaks about time. The granite was cut very recently (geologically) by a machine, so the cuts are very clean. However, parts have been arranged like they were broken to suggest the passage of time. But these fallen pieces still have sharp, clean corners that don’t look old at all. La Jolla Project reminds me of Stonehenge, which was built based on the celestial calendar. This one should last longer than any other Stuart collection item. The claim that La Jolla Project is the heaviest piece in the Stuart Art Collection may not be entirely accurate since the installation of the Teddy Bear in Warren Plaza.